Artist Colours Used by Impressionists and Expressionists. Musee d'Orsay, Paris. By Monet. The 19th century - essentially the beginning of modern art - was a period of huge change for both oil painters and watercolourists. New colours and enhanced versions of established pigments seemed to pop up with bewildering regularity, every few years. Cobalt Blue emerged in 1802, Chromium Green Oxide was introduced in 1809. Indian Yellow also arrived around this time. Cadmium Yellow appeared in 1817, Cerulean Blue in 1821, to be followed by a cheap synthetic Ultramarine, Zinc White, Rose Madder, Aureolin, Viridian, and Cobalt Violet. Problems remained of course, notably in pigment toxicity. Emerald Green, for instance, the favourite green hue of the unstable Post-Impressionist genius Vincent Van Gogh, was so poisonous it was marketed as Paris Green and employed to kill rats in the Parisian sewers! In addition, improving fine art paint manufacturing technology produced several crucial innovations - not least, the collapsible tin paint tube, invented in 1841 by American painter John Rand, which revolutionized the colour palette and technique of plein-air oil painting by offering a range of pre-mixed colours in a convenient, portable medium. This was a major factor in the emergence of Impressionism and other plein-air movements. 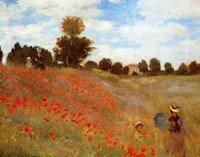 (For more, see Characteristics of Impressionist Painting 1870-1910.) Later in the century, the Sherwin-Williams paint manufacturing company perfected a formula to keep fine paint particles suspended in Linseed oil. Since then, artist-paint manufacturers have produced an ever-growing range of pre-mixed oil paints, completely eliminating the need for hand-ground pigments, and revolutionizing the practice of oil painting in the process. All this made the art of painting much more accessible to would-be artists, and thus fuelled the fine arts education system as well as the artist-paint market in general. The main reason for the introduction of new oil and watercolour paints had nothing to do with art: it came about almost entirely as a result of the huge demand for textile dyes for clothing. Thus when a new pigment was discovered, or an old one synthesized, the first beneficiaries were usually textile manufacturers: artist-quality versions of the pigments took longer to appear, as demand for such specialist colour products was smaller. NOTE: For an explanation of modern works by the likes of Monet and other colourists, see: Analysis of Modern Paintings (1800-2000). Here is a short list of the more important developments in colour and pigment technology during the 19th century, and their impact on the basic colour palette used by most painters. At the turn of the century, synthetic versions of red iron oxide pigments were being introduced in a variety of hues. These laboratory-made "natural earth" pigments, marketed as "Mars Reds" possessed all the qualities (eg. durability and permanence) of their natural counterparts like ochre. Also at the turn of the century, a new family of Lead-Chromate pigments was starting to appear, developed by the French colour-maker Louis Vauquelin. These new paints - Chrome Red, Chrome Orange and Chrome Yellow - had bright hues, better opacity and a low price, and quickly began to replace both Turner's Patent yellow and Orpiment. This costly but highly stable pure blue pigment was discovered by the French scientist Louis Jaques Thénard in 1802, after conducting a series of experiments at the Sevres porcelain factory. Cobalt Blue was a significant improvement on smalt - itself an improved version of the old Egyptian Blue pigment made from blue glass - and became the most important of all the cobalt pigments. It is completely stable in watercolour and fresco painting and an excellent alternative to ultramarine blue when painting skies. These were a new class of pigments, in hues of yellow, orange and red, formulated from the metal cadmium. Cadmium yellow was cadmium sulfide, to which increasing quantities of the mineral selenium were added to broaden the colour-range. Adding Viridian to Cadmium yellow produces the bright, pale green pigment cadmium green. Cadmium was discovered by Stromeyer in 1817, but actual production of pigments did not begin in earnest until 1840 due to a shortage of the metal. All of the cadmium pigments had great colour brilliance with the deeper tones having the greatest tinting strength. They were used in both oil painting and watercolour, although the brightness of their hues tended to fade in murals and fresco painting. The beautiful but prohibitively expensive pigment Ultramarine, obtained from the semi-precious stone lapis lazuli and long regarded as one of the finest natural artist-colours, was finally synthesized by both the Frenchman Jean Baptiste Guimet and the German chemist Christian Gottlob Gmelin in the late 1820s and early 1830s. Formulated from aluminium silicate with sulfur impurities, the synthetic version of Ultramarine was non-toxic and as permanent as the natural variety, but darker and less azure. It was made for both oil and watercolour paints. This is an umbrella term for three yellows introduced during the 1830s: Strontium Yellow, Barium Yellow and Zinc Yellow. All three were semi-transparent and employed in both oil and watercolour paints. Strontium Yellow was a cool, light yellow, more permanent and richer in tone than Barium Yellow. Although Zinc oxide was seen as a potential source of artist-white by French colourmakers in the 1780s, it wan't until the later discovery of zinc deposits in Europe that patents were granted for the production of zinc oxide to the English colourmaker John Atkinson, and others. By the early 1830s, Zinc White had appeared as a watercolour although it took longer to formulate it for use in oil paints. In 1834, Winsor and Newton, Limited, of London, presented a dense form of zinc oxide which was sold as Chinese white. In 1844, an improved Zinc White for oils was formulated by the French chemist LeClaire - it was slower to dry, less opaque, more permanent and less vulnerable to blackening than the major alternative Lead White. It was also non-toxic and cheaper. Also, LeClaire's Zinc White had a colder, cleaner, and whiter masstone than the best types of lead white (or even titanium white). Its only noticeable drawback was its brittleness which caused unmixed dry paint to crack. Discovered in 1797 by the French chemist Vauquelin, Viridian Green was only developed into an artist-quality paint around 1840. A highly stable and powerful cold green colour, it was non-toxic with excellent permanence. It replaced the highly poisonous fugitive colour known as Emerald Green. Also called Cobalt Yellow, this intense medium yellow pigment replaced Gamboge, an earlier pigment made from an Asian gum. Aureolin was synthesized in 1848 by the German chemist N.W. Fischer for both oil and watercolour painting, being replaced later in the 19th century by the less expensive, and more lightfast Cadmium pigments, and others. In 1856, the Englishman William Henry Perkin discovered mauveine, the first aniline dye. This was a technical breakthrough which led to the discovery of dozens of other synthetic dyes and pigments. The name of this 19th century greenish-blue pigment was based on the Latin word "caeruleum" (sky or heavens) previously used in Classical Antiquity to refer to numerous blue pigments. It was a highly stable, lightfast colourant, first formulated in 1821 by Hopfner, but not available generally until 1860 when it was reintroduced by George Rowney in England, as a paint-hue for oils and aquarelle watercolour painting. It was based on cobalt, but lacked the opacity and richness of cobalt blue. Nevertheless, in oil paint, it preserved its colour better than any other blue and was particularly popular with landscape artists when painting skies. Cobalt Violet was introduced in the early 1860s. Not unlike its older sister Cobalt Green, its drawbacks included high cost and weak colouring power, both of which limited its use among painters. It was quickly replaced by the cleaner, stronger pigment Manganese Violet. This new pigment, synthesized in 1868 by the German chemists, Grabe and Lieberman, was the synthetic version of the very old natural dye Rose Madder, found in Madder plants. Invented by the German chemist E. Leykauf in 1868, this purplish pigment - also known as Permanent Violet and Nuremberg Violet - replaced Cobalt Violet in 1890. It was a cleaner, less toxic pigment with improved opacity and colouring power. Although actually discovered as early as 1821, mass-production of this superb artist-quality pigment only began in the early 1920s. 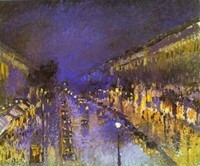 The 19th century witnessed an upsurge in art movements and painting styles that were based on certain colour theories. These movements included: Divisionism and Pointillism (Seurat/Signac) - see A Sunday Afternoon on the Island of La Grande Jatte (1884, AIC) - and Italian Divisionism (Grubicy, Balla). All these were part of the general Post-Impressionist painting movement (c.1880-1905). Although the 19th century artist colour palette was considerably strengthened by these new paints, it still featured a number of problem pigments, which persisted until the end of the period. The survival of these weaker products was due to a combination of factors, although ignorance was a major contributor. To begin with, ever since the breakdown of the traditional artist studio system - with its emphasis on hand-ground colourants and detailed knowledge of pigment performance - artists' understanding of colour had gradually declined. Secondly, both specialist and popular knowledge of the chemical attributes (notably toxicity) of certain metals and metallic compounds was still relatively small. Finally, it wasn't until the latter part of the century that paint-suppliers started looking more closely at how certain pigments were produced and eliminating unethically made products. Reportedly the favourite hue of both Paul Cezanne and Vincent van Gogh, this pigment had a brilliance unlike all other copper greens. Unfortunately it was extremely poisonous, and may even have contributed to the health of these two artists, among others. Unbelievably, this pigment was made from ground up Egyptian mummies imported into England - a process not terminated until the end of the century. This pigment, a solution of asphalt in oil or turpentine, had been used successfully by Old Masters (eg. Rembrandt) as a protective coating. In the 18th century and 19th century it was revived by many artists in order to give an "Old Master look" to their canvases. Whether or not the painters concerned failed to treat the pigment with the requisite care, it caused frequent darkening and cracking. This deep, luminous yellow pigment was made from the urine of cattle fed on mango leaves, a non-nutritious and cruel process which wasn't terminated until it was banned in 1908. This list of paint colours itemizes only the major additions. Many of the colours available during the 18th century were still available during the 19th century, as well as a wide variety of non-permanent plant colourants. Prussian Blue, Cobalt Blue, French Ultramarine (synthetic), Cerulean Blue, Mauve, Manganese Violet. Emerald Green, Viridian, Chromium Green Oxide, Cobalt Green. Rose Madder, Alizarin Crimson, Mars Reds. Cadmium Yellow, Chrome Yellow, Aureolin, Zinc Yellow, Strontium Yellow, Lemon Yellow (Barium Chromate), Indian Yellow.